PA officials say Trump's team must commit to two-state solution and oppose "settlements" before peace talks can move forward. U.S. President Donald Trump's team must commit to a two-state solution and oppose Israeli “settlement construction” before the Trump's peace push can move forward, Palestinian Arab officials said Wednesday, according to AFP. Their comments came ahead of talks on Thursday with Trump aides, including special representative for international negotiations Jason Greenblatt and the president's son-in-law and Middle East envoy Jared Kushner. Greenblatt and Kushner landed in Israel on Wednesday evening, and are scheduled to meet with Prime Minister Binyamin Netanyahu and Palestinian Authority (PA) chairman Mahmoud Abbas on Thursday. PA officials have become increasingly frustrated with the Trump administration and pessimistic about chances of a breakthrough. Ahmed Majdalani, a senior member of the Palestine Liberation Organization (PLO) which Abbas heads, told AFP on Wednesday they were demanding "a clear and frank answer on the position of the administration on the two-state solution and settlements." "Without a clear American commitment to the two-state solution and stopping settlements and ending the occupation, we don't expect much from this administration," he added. A U.S. diplomatic source told reporters in Jerusalem on Wednesday night that Trump wanted discussions "to focus on the transition to substantive... peace talks, the situation in Gaza, including how to ease the humanitarian crisis there, and the economic steps that can be taken". The president acknowledges that "there are likely to be a lot of ups and downs on the way to peace and making a peace deal will take time", but he "remains optimistic that progress toward a deal can be achieved," the official added. Earlier this week, Abbas's spokesman Nabil Abu Rudeineh said Palestinian Arabs are still waiting for a "clear vision" from the United States on resuming peace talks with Israel. Abbas "wants clarity" on the two-state solution, he said. The PA insists that any peace agreement with Israel be based on the formation of a Palestinian state with eastern Jerusalem as its capital. 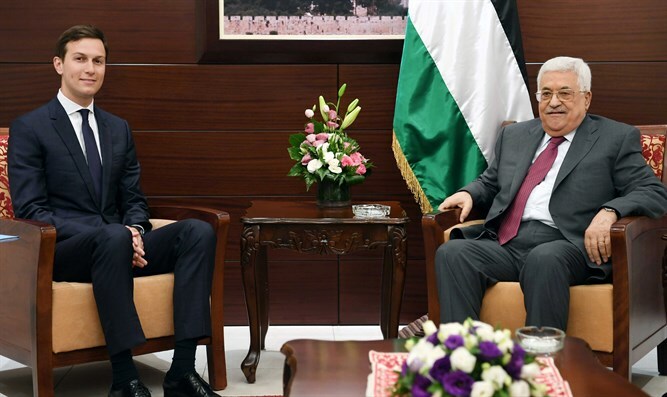 Abu Rudeineh’s comments are a repeat of a recent demand by Jordan and the PA. Abbas met with King Abdullah of Jordan several weeks ago, following which the two demanded that Washington establish a clear position regarding the establishment of a Palestinian state based on the pre-1967 borders. Omar al-Ghoul, a Palestinian Arab political analyst, said there was little optimism from the Palestinian leadership about the talks. "The level of optimism from the Palestinian leadership and people towards the Trump administration is zero," he told AFP. "There is not a glimmer of hope the administration will change its politics and positions," added al-Ghoul.